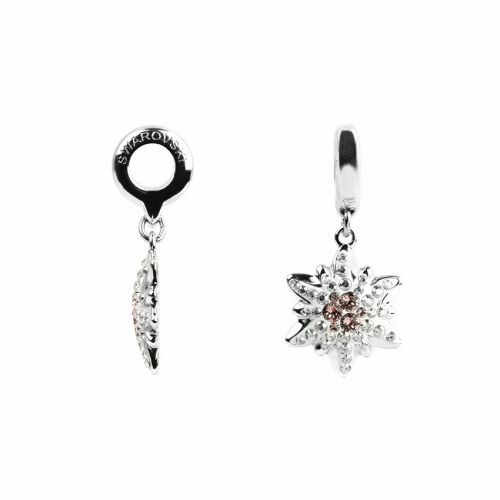 Wear this Swarovski crystal BeCharmed edelweiss in silver shade on your bracelet for wonderful sparkle. This Swarovski BeCharmed charm is available as part of the Fall/Winter 2016/2017 innovations range. When Swarovski was originally started by Daniel Swarovski, he decided to have his country's national flower as its logo - and so in celebration of 120 stunning years, Swarovski have launched this wonderful commemorative cut. This charm represents Swarovski's timeless nature and the brand name is on both sides of the ring for a constant reminder of quality. Charm (inclusive of threading ring) measures approx. 27mm. Threading hole measures approx. 4mm.